The private developer behind the plan to build a visitor's centre at the Giants Causeway has said he is a member of the DUP but never gave money to it. Seymour Sweeney was responding to a call from Sinn Fein for the DUP to clarify its relationship with him. 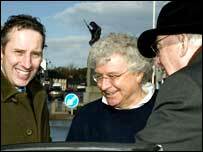 It has also emerged that Ian Paisley Jnr bought a house in Bushmills at full market value from Mr Sweeney. Environment Minister Arlene Foster said on Monday she had been "minded" to accept Mr Sweeney's proposal. On Tuesday, she said it was "rubbish" to suggest that she was influenced by Mr Sweeney's membership of the DUP. "A minister, when making decisions, cannot and should not investigate party affiliations of applicants, and I did not do so in this case," the minister said. "I do not know the applicant, have never met him, and know nothing about him. "If anyone impugns my integrity in this matter I will be seeking legal advice and will act accordingly." Mr Sweeney said he was a member of DUP and had signed nomination papers for a party councillor, but had "never given a penny piece to the party". The managing director of Seaport Ltd said he had never met Ms Foster or Nigel Dodds, the economy minister who has dropped plans to spend £21m of public money on the centre. He said he has met DUP leader Ian Paisley who is the MP in his area of North Antrim and Ian Paisley jnr who is an MLA for the area. The developer said he meets representatives of all the main political parties. North Antrim Sinn Fein MLA Daithi McKay had called on the DUP to clarify their relationship with the developer. Earlier, chairman of the Causeway Coast and Glen Heritage Trust Dr David Irwin said the backing for a privately-funded centre was "almost certain to provoke a judicial review". Ms Foster said she had visited the site and there was considerable merit to the Seaport Investments Ltd plan for a new Visitor and Study Centre at the site.